I have notes for translators, if you would add a translation. This "translations" block grew so large, that only recent translations appear here. Others are available further down the page. Sorry! But you can jump to the right place. This page, as it stood in March 19, translated by humans, into Turkish, by Patrick. This page, as it stood in June 18, translated by humans, into Dutch, by Philip. This page, as it stood in June 18, translated by humans, into German, by Philip. This page, as it stood in January 18, translated by humans, into Hindi, by the editorial team at HotDiscountCode.com. This page, as it stood in January 18, translated by humans, into Belarusian, by the Translation Team, at Pexels. The malignancy in the White House isn't the real problem. That is but a symptom. If he was no longer there, I could "move on". But Congress, as provided for in the Constitution has not removed the malignancy. I have to give the many people riding Trump's coat-tails grudging admiration. The other things that are going on, though less dramatic, are going to be... forgive me... more important in the long term. Which isn't to say the human rights abuses aren't serious. I wonder where the Nuremberg trials for the people who followed orders will be held. I wonder when people will stop fussing about Trump, and start doing something about those who did not remove him from the White House. I wonder when the world's international relations will be half way back to the already poor place they were before the USA became deranged. Don't tell me "he isn't my President". He is President of the United States of America. LibreOffice? Open Office? This link will take you to a sidebar on the similarities and differences, the issues. Whether you are using OpenOffice or LibreOffice, I think you are wise, and hope that my tutorials will as useful to you as to those using the other product. ...Sheepdog Guides Tutorials about using databases to Make Life Better. Page contents © TK Boyd, Sheepdog Software, 2/06-2/19. Second level tutorials: Slightly more advanced topics. Once you're past the stuff in those introductory tutorials, you should be ready to jump around to whatever has your interest in the following. Footer, with email link, etc. I try to make my pages browser friendly. Re-size your browser window so it is as wide as you want it. The text will flow nicely. It is easier to read in a narrow window... and the rest of your screen will be free for your ooBase exercises! Hold down the control key ("ctrl") and press the plus sign, the minus sign, or zero to change the size of the text in Firefox and other good browsers. This and another good hint explained on my Power Browsing page! Buttons at top of almost every page. Or mention these pages in forum discussions? If no one reads these things, there's not much point in me writing them. (Is that your message to me?) And no one reads them if they don't hear about them. Google searches cater for the masses. And the masses use a smartphone and have a 15 second attention span. These pages aren't for that audience. Are you new to ooBase? If so, you are advised to start with the tutorials in this section. They give you a tour, with limited repetition and overlap. Jump around if you wish, but doing them in sequence may be more productive. Whirlwind Tour. This tutorial is not typical of what I write. But it does take you, rather rapidly, though "doing things". Don't despair if it goes too quickly... I've explained things more fully elsewhere. In this whirlwind tour, you create a little table, run a simple report. From inside the tutorial, you can download a copy of the database the tutorial creates, saving you data entry time, and ensuring that no typos prevent your copy from working. Working with databases: an introduction. Have you worked with Access, dBase, Paradox, etc? Perhaps you could skip this... but it's short. Probably best to skim through it, just in case. If you don't need it, you should be able to read it quickly. If you can't read it quickly... you need it! "The form is 'read-only', I can't edit". This is a common worry for new users. You can edit your data! (Try it and see!) But you "can't" edit the form. Read this short note to learn that you can change the form's design, after all. Ubuntu Linux OpenOffice (and its database) installation. If you've got ooBase running smoothly, then you can skip this page... but have you tried to use the Forms Wizard? This page also addresses Java Engine issues. A simple address book table (names, addresses and phone numbers): Just to get us started. A simple query: A first look at queries, using the address book data. Primary keys: Short notes on something you must do for every table: include a primary key. Further comments appear in my Level Two tutorial on primary keys. Printing address labels: A quick guide, skipping some details. Printing (selected) address labels: An extension of the address book tutorial. Also discusses sorting and filtering. Referential Integrity, Multi-table Forms and Queries, Using Relationships These are important concepts... and the organization of my tutorials about them is imperfect, so I've created a "guide to the guides", which is what the link takes you to! Consider these after you are comfortable with simple ooBase operations, which are covered in the tutorials in the first section. Creating a form with a calculated field: An important skill, and it exercises other elementary skills. Don't think that because the "answer" for the sellers illustrates some nifty ways to make the database cough up Stuff. This isn't a "how to do" one thing. But knowing the basic "moves" isn't enough. This does go into "how to do" several things... but it also illustrates making features work together. Written in July 2015, it is not as long in the tooth as some of my tutorials, and it is also written more skillfully, benefiting the work I've put in prior to doing this one! Multiple tables, relationships, referential integrity: Written 6/07... a better-than-average tutorial... but my tutorials involving relationships have "grown like topsy", sorry, so I've prepared a guide to the different relationships tutorials. Importing tables from other places, e.g. non-ooBase databases: This seems to be a popular choice. It will help you with several things, including using CSV files to avoid re-typing data. It will help you migrate from a different database manager, e.g. the expensive Access. Alternative destinations: Moving things between Open Office applications, and How to export from ooBase to CSV. I also have a General introduction to Comma Separated Values (CSV) files for you. The separator is not always a comma, by the way. If you want to use a Microsoft Access database, I have a brief note on that for you, too. "Registering" databases, and creating backups: Read for the information on backing up your work, if nothing else. "Registering" remains a slight mystery to me, but this tutorial sheds some light, I hope! Putting Constraints on Tables: Keeping your database free of bad data; preventing invalid data. ListBoxes and ComboBoxes: Further aids to keeping your tables free of bad data. Referential Integrity, Multi-table Forms and Queries, Using Relationships These are important concepts... and the organization of my tutorials about them is imperfect, so I've created a "guide to the guides", which is what the link takes you to! One of them creates a database with two tables, and create queries and forms to extract information from the tables. This tutorial does not involve any report... the "result" is a form that assembles your data in one easy- to- use window. Displaying fields from multiple tables in one query: Using Joins. This is an unusual tutorial. For a start, it contains an introduction to buying and selling stock market calls and puts. It looks at a "bigger" project than is typical in these tutorials. It is long, but, I hope, worth it! It is also unusual in that there's a link allowing you to download the finished database. Primary keys: Further comments. Compound keys. Checksums. Extends the comments made in my Level One tutorial on primary keys. Consider these after you are comfortable with many of the things in previous sections. These are either peripheral topics, or difficult, requiring some ooBase experience. A "simple" report: Selected records, and arranging for them to be sorted: A straightforward requirement. Isn't difficult... when you know how. Which you will, after reading this somewhat unusual (for the tutorials on this site) tutorial. (In this one, I do less reader hand-holding than usual.) We will put together a tiny database (Two fields, six records.) Select a few records from it with a query. And present them, sorted (by the report) in a human friendly format. A few odds and ends of making your report "professional" included at the end of the tutorial. Written 9/14. Functions (add, count, minimum, etc) and grouping: Not my most polished tutorial! And I paint myself into a corner or two. But if you are wondering how to use functions in queries, this may help you. And if we both can master all of it, some very useful things become possible: Extracting from a database, for instance, the average score of 12 year olds who are in 7th grade when they attempt a timed mathematics test. (The database would hold scores from many children. The query would provide a table "slicing and dicing" the data to our needs.) The techniques involved open the way to finding, of a group of records, the total (sum), the average, the count, highest individual record, lowest, standard deviation. And that's just the functions! The tutorial also touches on grouping records. The tutorial comes with a downloadable database with sample data, and pre-typed queries, forms, reports to get you started. Moving data between Open Office Applications: Easier than you might fear! This is one of the peripheral topics. Cascading selectors... with datasheets: A form with a datasheet listing first names. You select one. When you have done that, a second datasheet on the form displays everyone with that first name in your "People" table. Cascading selectors: Second Level. Using a ListBox, and generally being more clever. Does the job first without a macro. Then, at the cost of a LITTLE macro, we improve on that solution. I won't promise that nothing involving a macro will appear anywhere else, but I will try to keep most things involving macros here. With ooBase 3.1 you can store macros within a given database's .odb file. You can store macros in the database they are for. You will also be able to have images in reports. (Give upgrading serious consideration, if you are still using something from before 3.1. I've done several OpenOffice upgrades over the years, under Windows, without regrets.. but take the usual precautions.) (For images in reports, you also need the Oracle Report Builder, previously known as the Sun Report Builder, or SRB. I did my tests with version 1.1. So far I can get a form to display images held in the database and images which only have the path to them stored in the database. So far, I can only get reports to print out images of the former sort. Another Good Thing in OO3.1 + SRB 1.1 is that a "Keep Ratio" option has been introduced for displaying images. OOP and Events: A an important tutorial covering fundamental elements and principles involved in any macro work with Open Office module. Some of the material here will help you understand practices that I follow when working with macros which are not "laid down" by the general requirements of Open Office. Not an easy read, but I commend it to you. First steps with Macros: An important tutorial if you want to work with macros in any Open Office module, or understand material in any of my other macros tutorials. A simple "Hello World" button is created to illustrate sundry points. Many things explained in words of one syllable. A beginner's tutorial, or a review for intermediate macro programmers. Miscellaneous thoughts on macro use: Not very well written, but if you want to master using macros, working your way through this will give you additional knowledge. Among other things, in this tutorial we look at working with a checkbox on an ooWriter document. Again: Explained in words of one syllable. Running some buttons with ooBasic: In this tutorial, you are given less help, you have to have some grasp of what you are doing... which you can attain by working through the tutorials above, if need be. User-defined functions: Creating new "words" for Open Office work, especially ooCalc. In this tutorial, we create a function which works out the "with tax" price of something when we know the "before tax" price and tax rate. Once we've done the things explained in the tutorial, we are able to merely put things like =tkbWithTax(200,3) in a worksheet, and get 206. Document properties: This looks at... without finding all of the answers... examining the properties of the document your macro is stored in. Along the way, we look at some of the documentation available to Open Office programmers.. the API and ooBase. Accessing functions and procedures inside external DLLs. A Windows .DLL is provided for your use while taking your first steps. An example is developed using an ooCalc worksheet, but I believe the principles are general. A function in the DLL is called; it returns a string, which we then display in a cell of the worksheet. A subroutine in the DLL puts "Hello World" on the screen in a message box, when something happens in the ooCalc worksheet to invoke the subroutine. The following tutorials assume that you have some knowledge of working with macros, which you can gain by working through the tutorials above! Exporting CSV with the click of a button: This is not just for people who want to export CSV. If you want to use macros with ooBase, read this essay. It takes you through the basic skills, using exporting a file to CSV as an example. It starts almost from scratch, but if you having used macros in Open Office before, or are a beginner, you would do well to review at least the first two tutorials in this, the "Macros" section. They talk about "simple" macros in Open Office. Everything they entail will be needed for working with macros in ooBase... and more! Where are the macros? This short essay discusses where macros are stored, and has details about a related ooBase issue. The pages in this section contain little snippets of "how to" information. They are less "tutorial" than those in the previous sections. Something you CAN'T do: ... at least not with Open Office: Access a MySQL server on the web hosting company "1and1.com"s servers... but I tell you how you can use data from such databases in your web pages, via PHP. Using dates in records to select records: If your database has dates in it, stored in the "date" data-type, a few "interesting" ramifications arise. This "how to" shows you how to build queries for extracting records based on dates in them. Using simple text files to append multiple records: Short and sweet... and the process works pretty well, too. Enter multiple records in a simple text file (CSV), and "send" those records to a table in your database, i.e. "append" them. Simple mailing list- creating mailing labels: Another "bad" tutorial- doesn't explain, you won't understand what you are doing... but it may give you a "click this" answer, if that's all you want. How to clone an Open Office database: Cloning your data tables, forms, queries, reports, and registering the clone. Sharing Data: How to give copies of a database to others; how to use on a different computer. Looking up things in the manual: There's a manual? Where to get it! Concatenate fields: Turn strings from two or more fields into one string. Make "Jane" and "Smith" - > "Jane Smith", for instance. Or even "Smith, Jane"! Radio buttons for forms: Radio buttons are a good way to help users enter only valid data. Also gives an example of stepwise development... a tool to get you where you want to be sooner rather than later. Less haste, more speed. Using DDE to synchronize documents. DDE is a mature technology for sharing data between documents, and Open Office has it "as standard". Draw maps with countries colored in according to data about them. There's a really easy way to get really impressive results! Fix Linux Form Wizard problems: There seems to have been an issue with the Forms Wizard with the ooBase installed by Ubuntu at one point. Problem may still exist. Easily fixed, but the "fix" may bring other issues... I'm not Ubuntu expert enough to know about that... but I haven't seen other problems in limited tests. Make an Auto-incrementing field: Using AutoValue to create fields which are filled in for you by the computer. Useful for primary keys, serial numbers, etc. Change Auto-increment Start: Do you have a field with AutoValue set true? Want to change the number that will be used for the next record? This "How to" tells you how... and it is easy to do! The following pages are less "keystroke- by- keystroke", less in the "how- to" vein. They are more like lectures. They are probably not as easy or as fun to read, but do give them a try? The are listed from "easy/ important" to "less easy / less critical" topics. While the one about data types isn't particularly easy, it is particularly important! Of course, I can't be sure which are important to your needs. I hope they are all useful! Cross populating forms with data from more than one table: If your database has more than one table, it is a Very Bad Idea to enter any data twice, i.e. "duplicated" (You hope! That's one of the problems) in two places. This incomplete essay talks a bit about this, and about how you can put data from more than one table into a single form, to bring together the things you want. CSV data files: A short, general explanation of "Comma Separated Values" files, aka "Comma Delimited" files... useful for moving data between applications. The specifics of using them in Open Office (generally) are explained elsewhere... specifics of importing data, of exporting it, and of moving data between Open Office applications. Run SQL command directly? Analyze SQL? : ooBase is (for a database!) novice-friendly. However, there comes a time when its "help" gets in the way. Then you run your SQL directly. Who cares. When. How to do it. (This page is merely about using SQL commands within Base. I have written elsewhere about using MySQL servers. "Just" a MySQL database server, with Open Office as "client", or "front end": This would be a challenge too... though not quite the challenge of the previous adventure. MySQL is a free multi-user, multi-platform database server. you can access a MySQL server across the internet. (ooBase on its own isn't multi-user or amenable to remote access.) The set of pages explaining a great deal about getting a MySQL server going were created in February and March 2013, and go farther than some of my earlier efforts with the topic. Master what is in them, and you will have made a good start towards being ready for the BIG challenge of embarking upon an Apache/ MySQL/ PHP installation, the item I mentioned before this one. Examples of databases filling specific needs. Also case studies of elements of database design. Don't look at the subjects of these case studies and say "Telephone numbers list? I don't need to do a telephone list." They all illustrate general points, and all may give you "That's a good idea!" thoughts. If it felicitously happens that you do need to set up a telephone numbers list, well and good, However, I attempted to achieve a more general usefulness as I wrote the case studies. In each, you read about decisions I took in solving a particular problem. You read about tools that I've used. You should take away ideas which are useful in many databases... for instance the database you are trying to create today! Primary Key design: Tricks of the trade. A discussion of the primary key I designed for the "Books" table of a database I actually use. (It is about a collection of books.) Many generally applicable points. Family History: A database of ancestors: A work in progress, but significant elements of a database to "pour" what you know... and how you know it... about people from the past. Marriages, children, important dates, etc. Linked Lists, DNA, Family History: This essay is a little different from most in the site. It talks (at length!) about a problem, and makes some progress with analyzing how to solve it. But a full, Open Office Base solution is not yet available. I hope someone can send a solution! Until then, the essay remains a valuable exercise in looking at data, and how it might be coded. The data would fill a matrix but sparsely. The data might best be stored in a linked list. Can such a structure be held in an RDBMS? The whole thing arose along the way to designing a database for matching DNA for the purposes of family history research. Department of Motor Vehicles- in Paradise: This database is a foundation for other tutorials. The database can be downloaded. It has four tables, with relationships established. It is the basis of a data management system for a hypothetical Caribbean island's traffic police. Form with two sub-forms: A modest little thing. In the context of a small database with information on plants as an example, a form with two sub-forms is created. Annual giving to charity: A database for keeping track of donations to worthy causes. No "rocket science"; a fairly basic system. Stock Market Investing: Notes on a database which tracks essential data for a stock market investor. Also, I hope, of interest to novice private investors, for general points on records you need to keep. A "real world" example: Description of some rather "messy" work done to satisfy some real world needs. Project Participation: A database tracking the people working on a group of projects. Useful as an illustration of having "lines" of info for multiple entities, and other things. You can download the database, if you wish. Not "complete" yet... but the description of the tables, useful in its own right, is. Some "Illustrations" to support many of the other pages on this website. They are readable on their own, and linked to frequently, especially in introductory tutorials. But you, gentle reader, are probably not a soldier, so I will not here digress into piling swivels, which in your case you have not got, or anything else that you have not got. ooBase main project manager window: Discusses the main window from which you normally manage any ooBase project. Some users of ooBase databases set up by others may be more familiar with a Switchboard front end, but most users will normally work through the window described here, which I usually refer to as "the ooBase main project manager window". "Design mode on/off" button and Form Navigator window: Two important tools for the designer. Don't confuse the form navigator with the more general navigator which you can launch with your F5 key. "Form Controls" and "More Controls" toolbars: How to access to them. Ever want to have "multiple rulers" in a Writer document? So you have a bit in the middle of a page, vertically, that is, with a different number of columns? Easy when you know how, which this tutorial on page layout in Open Office Writer will explain. 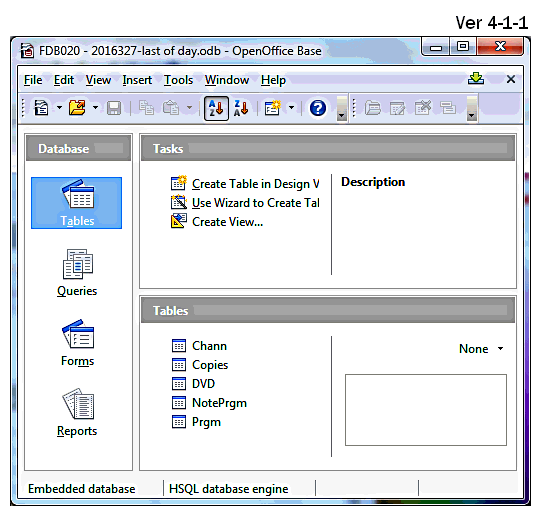 The database shipped with OpenOffice does typical database tasks well, and is as easy to use as anything of comparable power. It plays nicely with SQL, and obeys some SQL commands without further ado. See the articles above for help mastering ooBase. Forget any experiences with Adabas, which came with the commercial version of OpenOffice 1. Since version 2 of OpenOffice.. a LONG time ago!... ooBase is unrelated to Adabas. Speaking of the wonderful world of open source programs, have you tried the open software and open hardware Arduino microcontroller? A lot of fun, if you like tinkering with electronics. And if you are only into software, there's the multi-platform Pascal called FPC, which I promote at the same page as my Arduino material. FPC comes in versions for Window, Linux, and Macs. "Our group was formed in 2001... We have... released six new versions of the database (RDMS) since April 2001... The project enjoys a top 50 ranking among all SourceForge projects (100,000) with over 1,000,000 downloads. "(HSQL is) completely free to use and distribute under our licenses, (which are) based on the standard BSD license." "BASE includes a full version of the HSQL database engine, storing data in XML files. It can also access dBASE files natively for simple database work. "For more advanced requirements, BASE supports many popular databases database natively (Adabas D, ADO, Microsoft Access, MySQL), or any database through industry-standard ODBC and JDBC drivers. It also supports any LDAP compliant address book, as well as common formats such as Microsoft Outlook, Microsoft Windows, and Mozilla." (N.B. : In the case of at least Access, that support includes access to tables within the database, but excludes any capability to run Access macros, forms, reports. But that's a glass more than half full, if you think about it. See also- a few recent translations in the list at the top of the page. This page, as it stood in November 17, translated by humans, into Estonian, by Erelis, at crowfer.com. This page, as it stood in September 17, translated by humans, into Slovenian, by Sophi, at dreamicus.com. This page, as it stood in July 17, translated by humans, into Bosnian. This page, as it stood in Jun 17, translated by humans, into Russian by the Translator Group at BestReviewsBase.com. This page, as it stood in Apr 17, translated by humans, into Macedonian by Katerina Nestiv. This page, as it stood in Dec 16, translated by humans, into Indonesian by ChameleonJohn.com. This page, as it stood in July 2016, translated by humans, into Hungarian by Zsolt Boros. If you are new to databases, please realize that, powerful as they are, you will not be able to drive one as easily as you did your first driving of wordprocessors or spreadsheets. But databases ARE worth the trouble you will have to take. If you were an apprentice carpenter, you might find yourself having to learn that a hammer doesn't make a very good screwdriver. Hammers work... but there are better ways. It might pay you to study some general pages about relational database management software. (That's what most of what we call "databases" are... even if we don't always use the "relational" part... at first!). There are many, many good pages out there, but I like the following... and the editor was kind enough to give me a link from his page! Guides to working with database managers, generally... start here! When I started this in early 2006, I was new to OpenOffice, but not new to computers, or to writing tutorials on the web. I find online forums are the most helpful source of help to me. I have a page with my current forum recommendations for you. There are other OpenOffice tutorials out there that I would commend to you. Of course, you should read OpenOffice's own Getting Started With ooBase (PDF document)... although, sadly that may well be dated... the page was stillheaded "Getting Started with OpenOffice.org 2.x" when I checked it in June 2015, and Base has been in version 4 for a long time, and there are big differences between Base 2.x and Base 4.x. Andrew Pitonyak has a site with help on ooBase, and other Open Office topics, and other topics! A fine site, with LOTS of information: "Tutorials for OpenOffice"
Reference SQL commands available: Summary at http://www.hsqldb.org/... just one chapter of many with Base relevant information. Please don't ask for a link from here to your site unless a) your site already has a link to this site, and b) the Wayback Machine will show me that your site has been up for more than two years. Using the Arduino Microprocessor: These things are Just Too Much Fun, if you have even a little bit of Geek. You don't need a lot of money. Check out the introduction, anyway? Pages about using computers in Sensing and Control, e.g. weather logging. Programming: Lazarus... a Pascal based free, open source, multi-platform language. And it works! Tutorials. Programming: Delphi and Pascal tutorials. Introduction MicroLan: a powerful family of devices for sensing and control. This is not consumer-level stuff, but neither is it not beyond the means of enthusiastic amateurs. I also have tutorials for you about programming 1-Wire (tm) chips and devices for MicroLans (tm).